Note: the cover was printed to look like a beat up old comic book – this isn’t a damaged copy, they all look like this. 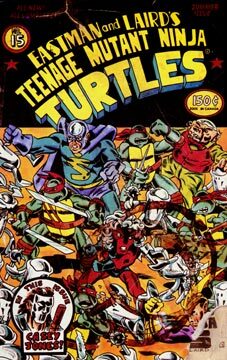 This issue opens with Casey Jones, Raphael and Michaelangelo checking out the comic books at Steve’s Comics shop. As the guys search for cheap back issues, the store is attacked by weird little robots that crash through the front window brandishing maces. Raph, Mike and Casey start bashing the bogus ‘bots as the shop’s diminutive, long haired stock boy morphs into a costumed hero and joins the fray. Mikey smashes a robot and it flies into the forehead of the store’s proprietor, an old gentleman named Stainless Steve… fortunately Steve has a forehead made of metal, so the head-on collision didn’t affect him. Once the robots are defeated, a holograph is projected from one of them. The image is of an ugly little man with a clear dome on the top of his head which reveals his brain. He announces that his name is Dr. Dome and that this attack on the Justice Force is but “a minor harbinger of the calamity to follow!” and then he laughs maniacally before the robot explodes and the projection is lost. Mike, Raph and Casey are confused, so Stainless Steve explains the situation. Apparently the Justice Force is a retired group of super heroes and Dome is their old adversary. The appearance of the villain is as much of a surprise to Steve as it is to Raph, Mike and Casey. Stainless Steve uses an old J.F. communicator to signal the rest of the team, which consists of Stainless Steve, Metal Head (the stock boy), Captain Deadbolt, Zippy Lad, Joey Lastic the Rubberband and Battling Bernice. Steve takes Mike, Raph, Don, Leo and Casey to his huge house out in the suburbs to introduce them to the Justice Force. The Turtles have offered their assistance in defeating Dr. Dome and his mechanical minions. As the group arrives at the front door, Steve remarks that he hadn’t left it unlocked… but it is now. Everyone prepares for battle. Our heroes burst through the doors and are met by a costumed man in a wheelchair. “Zippy!” exclaims Metal Head as he rushes to hug his old friend. Joey Elastic is also there and the old timers explain how the years of wear and tear have taken a toll on their bodies and abilities, but they’re still rarin’ to go. We find out that Captain Deadbolt is missing and then the guys hear something on the roof. When Leo opens an attic window to find out what’s going on, he’s greeted by the sight of dozens of little robots, all armed with Medieval weaponry. Leo and Casey get busy fighting the robots on the roof, while the others battle the invading machines downstairs. Our heroes win the skirmish in quick fashion, but are greeted on the front lawn by Dr. Dome in a giant robot that he dubs the Domebot. Just then Battling Bernice shows up and kicks the giant mechanical beast in the knee, shattering it and causing the machine to collapse. Bernice then kicks out the windshield of the robot and drags Dr. Dome out. As BB holds Dome up by the collar and demands to know why the little villain is doing this, he explains that he wanted to bring her out of hiding, as he’s been in love with her for 25 years and needed to see her again. Bernice states that she isn’t the original Battling Bernice, but her daughter, Ananda. Ananda tells Dome that her mother passed away 3 years ago, and that he has ruined his life by allowing her mother’s rejection of him to turn him into a villain (apparently Dome had been a member of the Justice Force until he had a falling out with Bernice). As Ananda chastises Dr. Dome, Stainless Steve interrupts and offers the villain a chance for redemption – Steve asks Dome to move into his estate, where they can try to heal old wounds. Dr. Dome agrees. Later, we see Raph and Mike on the porch of the farm house. Mike is reading an old Justice Force comic while Raph ponders how long the truce will last.